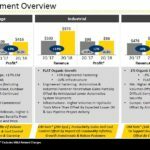 Stanley Black & Decker is currently fairly valued and I view it as an attractive investment for disciplined investors with a long-term investment horizon. It is a member of the exclusive Dividend Kings group of companies. These are companies which have a 50+ year of uninterrupted dividend increases. The company released its Q2 results on July 20. The range for adjusted projected 2018 EPS remained unchanged but GAAP EPS was revised downward. Projected earnings were negatively impacted by various headwinds but SWK has implemented price increases and has undertaken cost and productivity measures. A component of the downward revision in projected EPS is attributed to a recently announced settlement in which SWK will spend ~$0.1B to speed up environmental damage cleanup work at a Superfund Site. Litigation related to this matter has been ongoing for nearly eight years. SWK very recently announced an increase to its dividend marking the 51st consecutive annual dividend increase. I currently view SWK as fairly valued. In my January 31, 2018 article on my Financial Freedom is a Journey blog I suggested that Stanley Black & Decker (NYSE: SWK) was overvalued despite having pulled back ~6% from the recent 52 week high set less than half a month before my article. While it is certainly a great company with 21 well known brands I suggested readers refrain from purchasing shares until such time as they became more fairly valued. On April 22 I wrote that the current stock, which was ~20% below the mid-January high, now made it attractively valued for long-term investors. 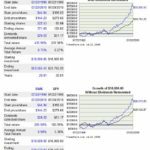 Based on my analysis I acquired 300 shares @ $142.809 for the FFJ Portfolio. SWK’s share price pulled back a bit further subsequent to my article but popped when it reported Q2 results on July 20th. In this article I briefly touch upon Q2 results and management’s outlook for the remainder of the current fiscal year. Readers may also be interested in knowing SWK’s Board of Directors recently approved a ~6.6% increase in the company’s dividend. 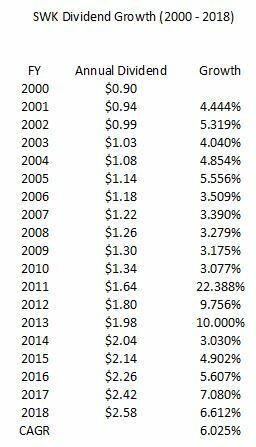 This is in line with the ~6% annual dividend increase over the past ~18 years. In my April 20th article I forecast a 4.5% - 7% dividend increase announcement in July 2018 which was in keeping with the 2015 – 2017 dividend increases. While some readers may scoff at this ~6.6% increase, I suggest the ‘Rule of 72’ be taken into consideration. 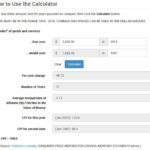 For those unfamiliar with this rule, it is a simplified way to determine how long an investment will take to double given a fixed annual rate of interest. Simply divide 72 by the annual rate of return and you get a rough estimate of the number of years it will take for your initial investment to double. 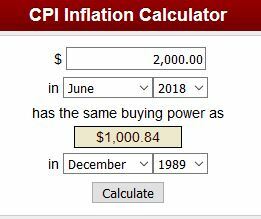 I know some readers may scoff at the idea of doubling your money every 10 years so I thought I would use the US CPI Inflation Calculator to see how long ago $2000 in June 2018 would be the equivalent of $1000. The answer: December 1989! I also did the same thing for Canadian readers. The answer: late 1986 – early 1987! 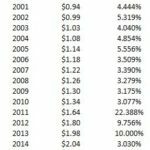 Using the Rule of 72 we see that SWK’s dividend doubled in ~12 years (72/6%) - refer the Dividend, Dividend Yield, and Dividend Payout Ratio section of this article. 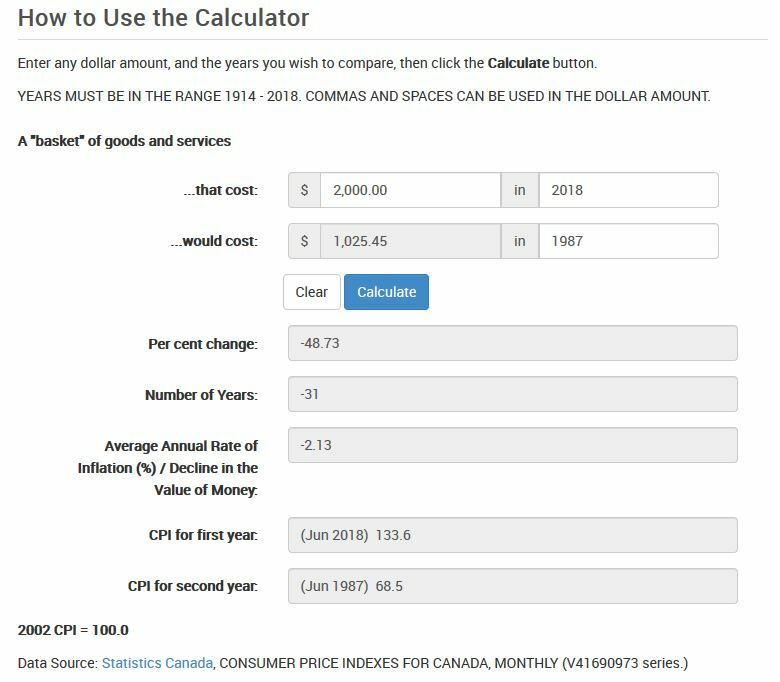 It certainly took a lot longer than that for the value of a dollar to depreciate 50% in value in Canada and the US! I recognize not all investors approach investing the way I do. If you happen to be like me, however, you view the growth in a company’s stock price as a ‘nice to have’ and the growth in the company’s dividend to be of equal/greater importance. As background, I was ready to retire in my early 40s but couldn’t quite figure out how I would keep myself busy during the workweek so I continued to work. When I finally retired in my mid-50s I had absolutely NO desire to ever re-enter the workforce. 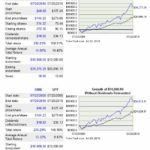 To ensure I would never be faced with the predicament of having to return to work, my primary focus has been on continuing to grow the sustainable dividend income generated by the holdings in our investment portfolio. This does NOT mean I chase dividend yield and, quite frankly, high dividend yield stocks give me cause for concern. I recognize many readers seek highly attractive dividend yields but my conservative nature is such that I always look at risk and yield as a ‘two sided coin’. The higher the yield, the higher the risk (typically). Given my conservative nature, when I analyzed SWK a few months ago I was attracted to its low dividend payout ratio; the likelihood of a dividend cut being remote is an attractive feature. SWK also appealed to me in that it has the distinction of being a member of a small subset of publicly traded North American companies which has increased its dividend for 50+ consecutive years. Dividend reductions and/or freezes are of little appeal to me. 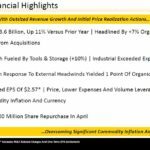 Stanley Black & Decker’s (NYSE: SWK) Q2 results released July 20, 2018 can be found here. SWK delivered an impressive Q2 and reaffirmed total year EPS adjusted forward guidance; it reduced its forward EPS guidance (see FY2018 Outlook section of this article). This was achieved despite headwinds which included input cost inflation, FX and tariffs. In order to achieve impressive YTD results, SWK increased sales and tightly controlled its costs. SWK continues to see strong underlying demand and share gain in Tools & Storage in most areas around the globe. It remains focused on completing the integration of its acquisitions, program managing the Craftsman rollout, and delivering strong gains in emerging markets and e-commerce. On the July 20th conference call, management indicated the Craftsman brand was originally expected to reach $1B in sales in year 10. Management is now confident this timeframe will be shorter and the potential for this program to exceed $1B within 10 years is extremely realistic. In SWK’s Industrial line of business, total segment growth was 14%, with an 11 point contribution from the Nelson Fasteners acquisition. Engineered Fastening and Hydraulic Tools more than offset the expected decline in oil and gas and this area of SWK’s business continues to achieve significant penetration gains in automotive fasteners. SWK continues to deliver double-digit growth and share gain in the Emerging Markets. E-commerce continues to remain a key commercial driver in the emerging markets and developed markets with in excess of $1B in growth. The Security segment demonstrated total growth of 6% and a 10% operating margin which was 1% lower than the prior year as a result of targeted investments to support the ongoing transformation of the business. This area of the company is targeting the following 3 key areas within commercial electronic security so as to position the business for sustained revenue growth and margin expansion over the next 2 years. leveraging business analytics to provide key business insights to SWK’s large national account customers. 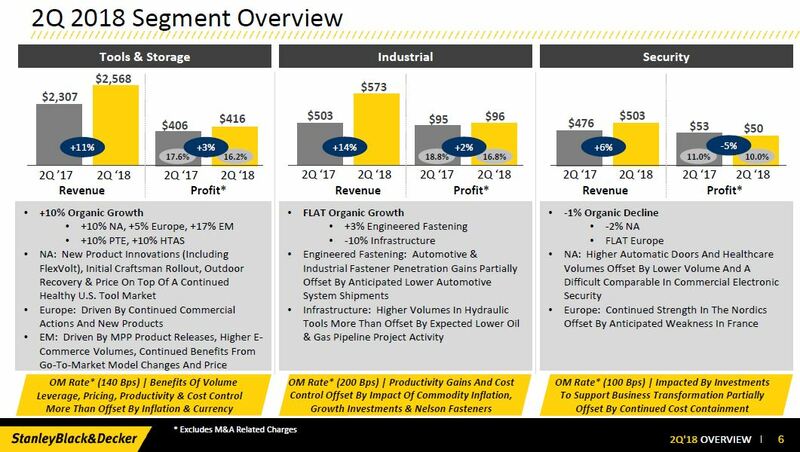 On the conference call, management indicated the M&A pipeline is strong and includes several strategically and financially attractive growth opportunities under review. I am a huge supporter of using Free Cash Flow (FCF) to determine the financial health of a company so I was initially concerned when I saw negative $0.369B YTD FCF. My concerns were alleviated when management indicated the YTD decline versus the prior year is predominantly explained by carrying higher amounts of working capital to support the outsized level of organic growth and upcoming Tools & Storage product launches plus higher tax payments related to the newly enacted U.S. total charge. Management has indicated it is confident strong cash flow generation will be achieved in the second half of the current fiscal year and it reiterated its commitment to deliver a FCF conversion rate of ~100% supported by strong cash flow generation in the second half of the current fiscal year. On the Q1 conference call management spoke about headwinds. 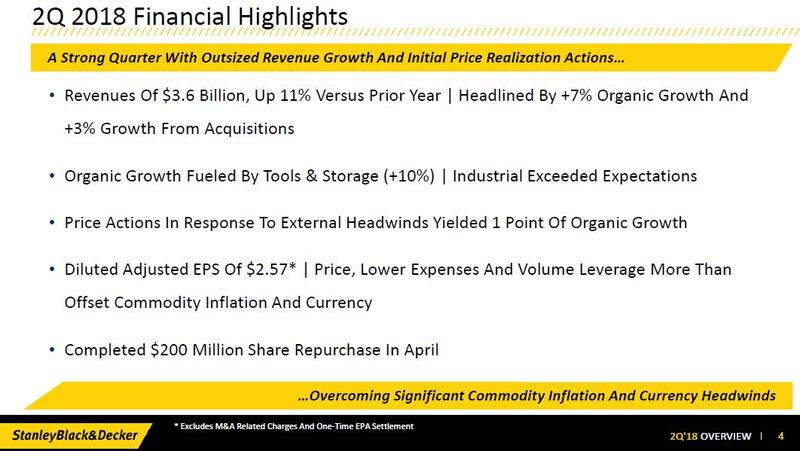 In the Q2 conference call it provided an update on these headwinds and the steps being taken to address same. Elevated commodity prices of ~$0.205B are expected in FY2018 of which ~$0.1B have already been realized YTD; this is a $0.025B increase from the previous expectation of $0.18B. Steel, batteries and base metals remain the most significant commodities generating this headwind. In the last month of Q2, SWK witnessed a significant negative impact from the strengthening of the USD. Management estimates this headwind will be ~$0.08B and in response, an initial set of price increases was implemented in June and further price increases are expected in Q3. SWK is taking measures to mitigate the impact of recently implemented tariffs and possible additional tariffs through price increases and cost and productivity measures. This includes discretionary cost reductions and the pacing of some investments that have longer term paybacks; the postponement of these investments will not jeopardize key programs that support organic growth in the short to medium-term. On the Q2 conference call, management reiterated its 2018 adjusted EPS guidance of $8.30 - $8.50 (a ~13% increase versus the prior year as at the end of Q2). On a GAAP basis, EPS has been revised downward to $7 - $7.20 (inclusive of M&A and other charges) versus $7.40 - $7.60 guidance provided at the end of Q1. This change is related to the recently announced CPA settlement. On the very rare occasion I will retain an investment in a company if a company’s long-term credit rating has been downgraded. An example would be with my Becton Dickinson (NYSE: BDX) investment. BDX made two transformational acquisitions in recent years which resulted in a very different balance sheet from when I initiated my BDX investment about a decade ago. I will not, however, chase dividend yield if it means I must assume undue credit risk (ie. poor credit rating). This is why I review a company’s credit rating (and trend) before I conduct any analysis on a company. Prior to initiating a position in SWK in April 2018, I noted that Moody’s had rated SWK’s Senior Unsecured Long-term Debt as Baa1 (stable) since March 2010. This is the upper tier within the lower medium grade credit rating range. Standard & Poor’s had rated the same debt as A (stable) and this rating had remained unchanged since January 1988. This is the middle tier within the upper medium grade credit rating range. These ratings have not changed subsequent to me initiating my SWK position and are satisfactory for my purposes. When I reviewed SWK in my January 31, 2018 article, I found SWK to be richly valued. At the time of that article, SWK had reported adjusted diluted EPS of $7.45 for fiscal 2017 and had projected adjusted diluted EPS of $8.30 - $8.50 for fiscal 2018. Based on the January 30, 2018 closing stock price of $166.36, I arrived at a forward adjusted PE of ~19.57 - ~20.04. While this certainly was an improvement from the valuation level from two weeks prior when SWK’s stock price reached ~$176, I still felt the January 30th valuation was a bit too rich for my liking. 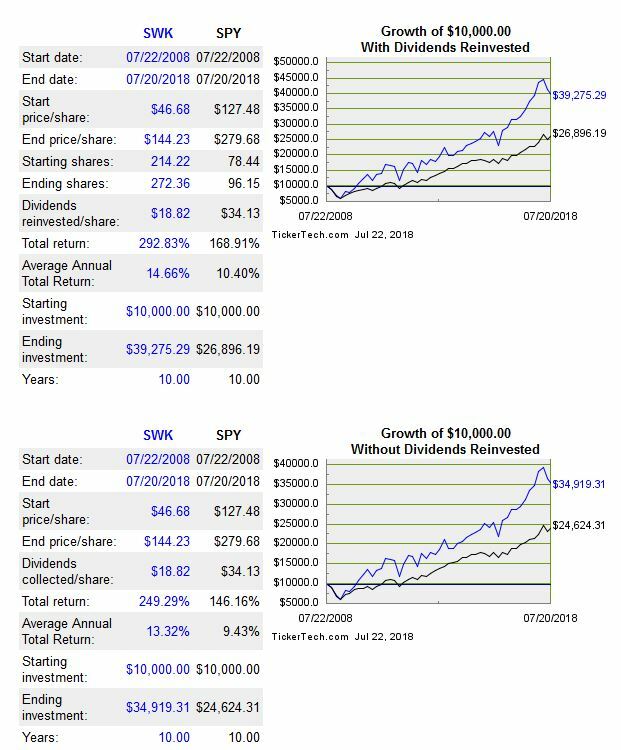 I revisited SWK in my April 20, 2018 article at which time the stock price had retraced to $144.21 and the GAAP EPS range had been revised to $7.40 - $7.60 from $7.80 - $8.00 (the adjusted diluted EPS range remained unchanged at $8.30 - $8.50). This gave me a forward PE range of ~18.98 - ~19.49 and an adjusted forward PE range of ~16.97 - ~17.37. SWK has now projected a GAAP EPS range of $7.00 - $7.20 and an adjusted diluted EPS range of $8.30 - $8.50 (unchanged). Using a July 20 closing stock price of $144.23, I arrive at a forward PE range of ~20- ~20.6 and an adjusted forward PE range of ~16.97 - ~17.38. I view these levels as attractive for a company of SWK’s quality. SWK’s dividend history can be found here and its recent dividend increase announcement can be found here; the $0.63 quarterly dividend has been increased to $0.66. This is a ~4.76% dividend increase but I calculate a company’s dividend growth on the basis of a company’s fiscal year end. As a result, my calculations reflect dividend growth of ~6.6%. As noted in the ‘Introduction’ to my article, SWK’s 6% dividend growth over an extended period of time outpaces the rate of inflation. I also draw to your attention as to how SWK has performed relative to the S&P 500 over a 10 and a 20 year timeframe. 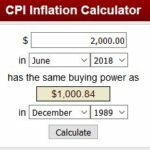 It has outperformed the S&P 500 and the rate of inflation! If your investment decisions are heavily determined by a company’s dividend yield, it is entirely likely SWK will be of little appeal to you. On the basis of the current $144.23 June 20 closing stock price, a $2.58 annual dividend yields ~1.78%. I am also not interested in investing in a company where the dividend payout ratio leaves the company little margin for error. We know that SWK’s recently revised projected GAAP EPS range is $7.00 - $7.20 so the $2.58 dividend is a payout of ~35.8% - ~36.85%. The outlook for 2018’s adjusted forward EPS is $8.30 - $8.50 so the projected $2.58 dividend is a payout ratio of ~30.4% - ~31.1%. All these payout levels are satisfactory for my purposes. During the Q2 analyst conference call, SWK’s President and Chief Executive Officer indicated some of the most challenging short-term capital allocation decisions involve trade-offs between pursuing specific M&A opportunities versus the repurchase of SWK’s own equity. allocate excess capital 50% to M&A and the other 50% to returning capital to shareholders in the form of dividends and share repurchases. 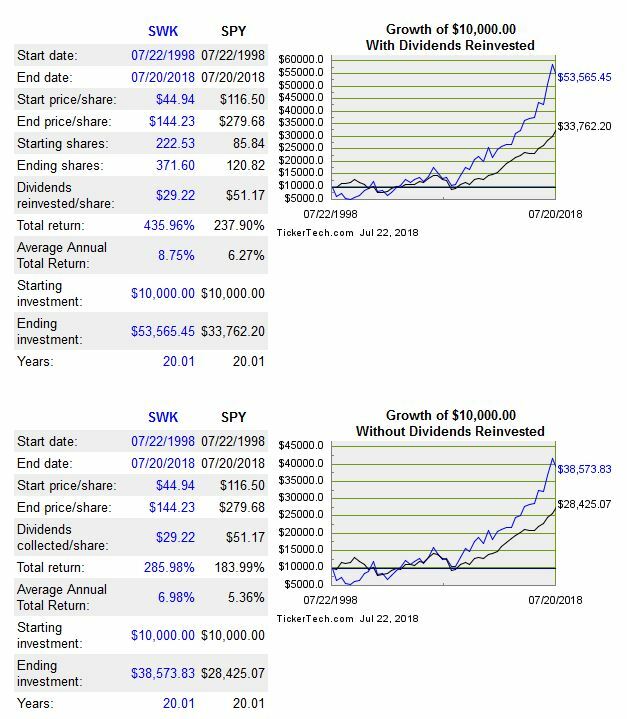 I view SWK as fairly valued at current levels for investors with a long-term investment timeframe. Disclosure: I am long SWK and BDX.